I've been teasing my Halloween costume for the past couple weeks, but I actually decided on the idea over a year ago and just didn't get it together in time for last Halloween. 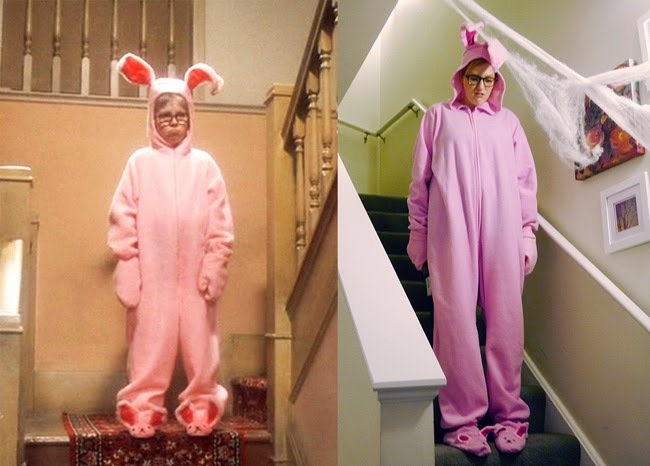 A Christmas Story is definitely my favorite Christmas movie and I quote it year round, so Ralphie in the bunny costume seemed like a no brainer. For some reason I had it in my head that the costume would be really hard to make, but it actually ended up being super easy. Step one was to buy a pair of hooded footie pajamas. I found mine at footedpajamas.com, and since I was shopping off season they were on super sale. Then I proceeded to wear them around the house for six months (Jeff even wore them once too ;). I originally considered buying two pairs of pajamas so that I would have extra matching fabric for the ears, feet, and gloves, but instead I just took a swatch with me to the fabric store and found a near exact match of fleece. I got a quarter yard of the lighter pink and a quarter yard of a darker pink to use for the inside of the ears. I also picked up some googly eyes for the feet and some thin floral wire. For the ears, I decided I didn't want them connected to the hood. As a faux redhead who pretends she has the same experiences as real redheads, I'm very temperature sensitive, and knew that odds were I would not be able to keep a hood on for very long. Instead, I decided to attach the ears to a headband so I could wear them separately. I found an old headband and whip stitched a cover out of the extra light pink fabric. 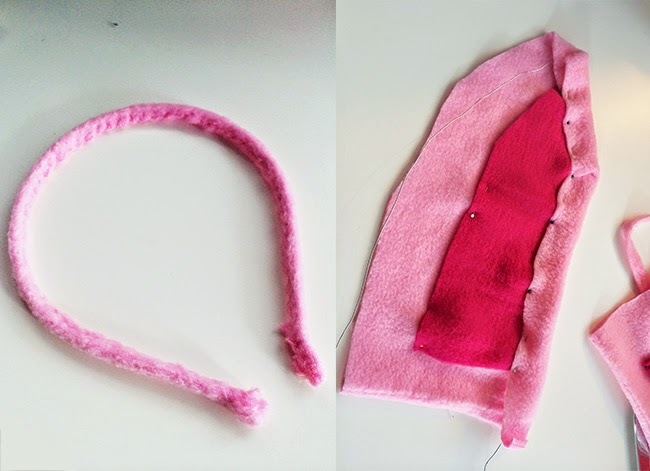 For the ears themselves, I cut out pieces of the hot pink and light pink fabrics, and then cut a piece of wire to fit around the perimeter of the hot pink piece, plus a little extra. 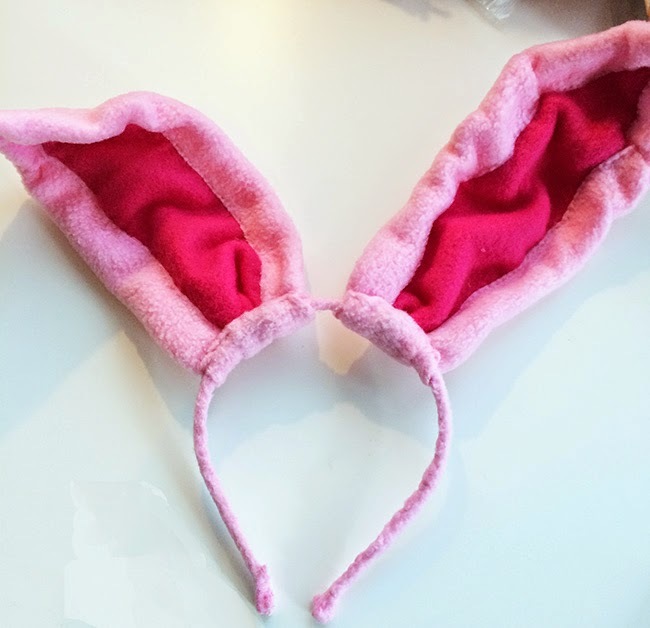 I then sewed the ears together with the wire (but you could easily glue them or use liquid stitch). I did not sew the bottoms at first, and instead wrapped the bottom of the wire around my headband, and then wrapped and sewed the bottom of the ear around the headband. For the feet, I made smaller versions of the ears, then glued on some googley eyes and used a permanent marker to draw a nose & mouth. 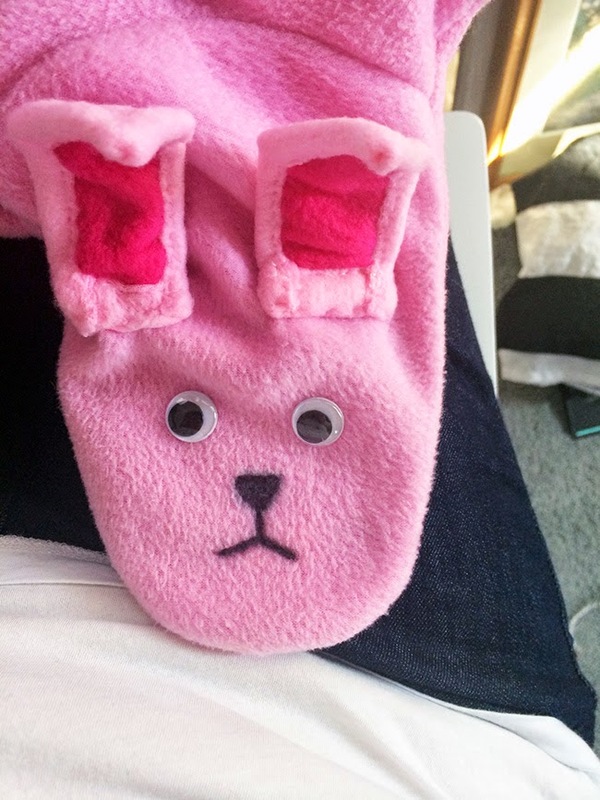 I forgot to take a picture of this, but I also decided to make mittens out of some of my remaining light pink fabric since Ralphie's bunny suit covers his hands. 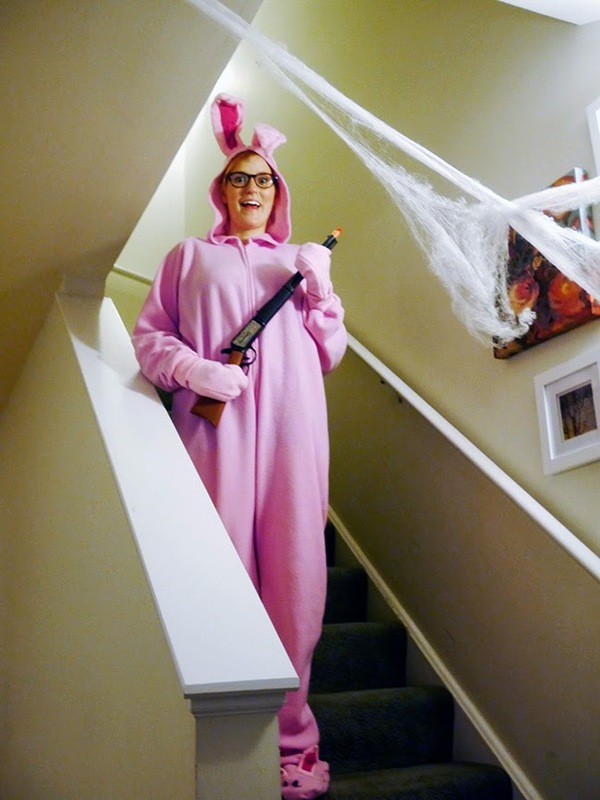 To make myself more recognizable as Ralphie, I also had to have a Red Rider BB Gun. I found mine on eBay for ten bucks or so. My gun shot air darts, you know, so I wouldn't really shoot my eye out. You are cracking me up! SO good! this is SO GOOD! and so cozy and warm. really it's the ideal costume! This costume is seriously the best ever! This is so much fun and you are so creative! Great halloween costume. Great job! 2.) i LOVE the new layout/design/etc.